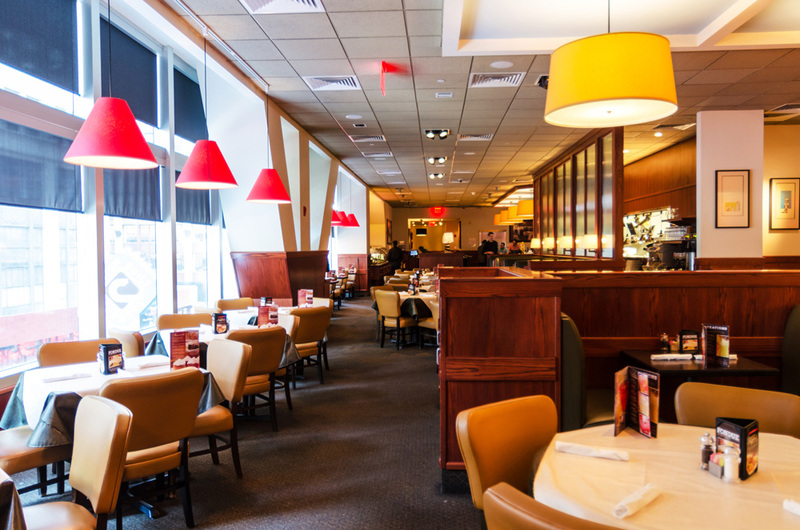 Come ring in the New Year at Times Square's massive Ruby Tuesday. 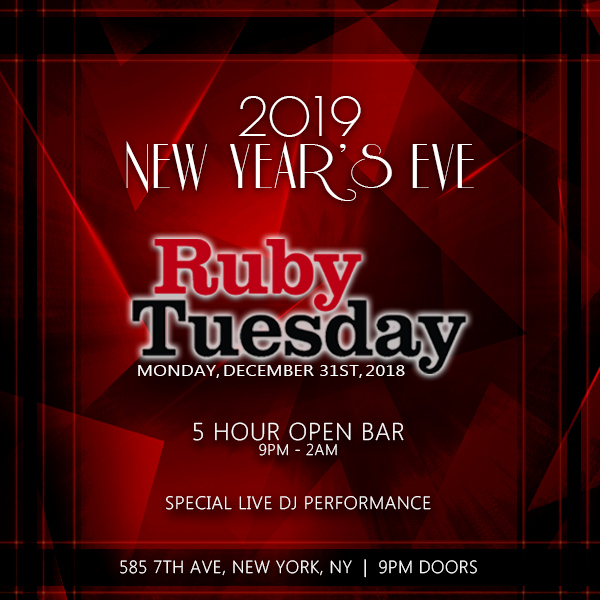 New York City's epic Ruby location hosts a sprawling, two-level party with all the drinks, food, and dancing you've dreamed of - at the base of the New Year's Eve Ball Drop, right in the heart of NYC's Times Square excitement. This New Year's, say "Hello" to Ruby Tuesday... and the best event of your life. Ruby Tuesday's mission is delivering food and drinks with Quality, Passion, and Pride. But this New Year's Eve, you can add DJs, Dancing, and NYE ecstasy to that order. 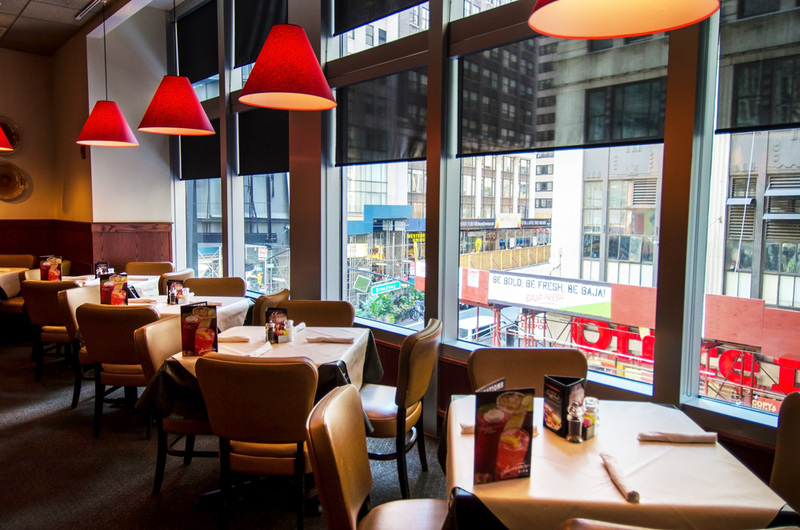 This vast Ruby Tuesday location, spread over two levels, is one of the biggest parties in NYC this New Year's. The 7, 500 square foot upstairs dance floor hosts one of NYC's biggest and best dance parties and features a 5-hour open bar to whet your whistle with a delightful array of liquor, beer, and wine. Live DJs will be spinning the best old school beats to provide the perfect soundtrack to an amazing NYE. And 2 hours of Ruby's signature appetizers will be on hand, in a feast for the senses that has all the flavor you know you love. Those looking for the VIP treatment will have additional access to the 3,000 square foot VIP section, with bottle service and a special selection of VIP appetizers. With a complimentary toast at midnight for all, it adds up to everything and more for you, your friends, and your family this NYE at Ruby Tuesday Times Square. Say hello to a bigger and better New Year at Ruby Tuesday this NYE. Served throughout the entire restaurant to all guests. This service will provide a selection of Ruby Tuesday's Sampler Platters, served family style on the table. This will be in addition to the passed appetizers above.